Relying on text-based instruction may be disenfranchising many students, whilst technology enhanced environments can provide significant advantages to a growing market of non-traditional learners. This paper reports on research investigating the perceptions of first year distance education students studying a foundation communications course using a multimodal learning environment. It demonstrates higher levels of engagement are possible when a neomillennial learning approach is adopted for designing course materials catering to a diverse student body, whilst maintaining a balanced environment for more traditional learners. A strong acceptance was moderated by a desire to still receive some print-based materials. 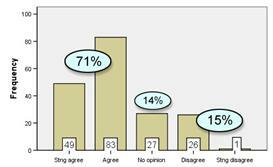 However, students reported a preference to receive an electronic version when given a choice. Keywords: Transmodal delivery; neomillenial, multimodal design; multimedia; learning styles. The University of Southern Queensland (USQ) is a dual-mode institution with 'triple-option' teaching modes (on-campus, distance education, and online). It is currently the second largest distance education provider in Australia (see Table 1), with 75% of its students studying in this mode, with almost 90 nationalities represented. At USQ, as with many other institutions in Australia, distance education course materials have traditionally been delivered via static print-based packages. However, advances in technology and the greater use of multimedia in education have provided an opportunity for course leaders and designers to enrich students' learning experiences by providing technology-based learning resources that comprise a range of multimedia and online components. A range of forces including, pedagogical, opportunistic, pragmatic, and psychological motivations, have encouraged many educators to adopt these educational technologies to enhance the delivery their courses (Sankey & Birch, 2005). However, it has become increasingly clear that maintaining so many different approaches is economically unsustainable. Aligned with this concern is the increasing demand from off-campus students to be provided with more than simply a correspondence model. This paper seeks to demonstrate that higher levels of student engagement are possible, and that course materials can be designed to cater to learners with a range of different learning modalities and backgrounds. It also investigates the implications of catering to a wide range of students, proposing that one approach is to consider the notion of a neomillennial learning approach. 'Neo-' in this context meaning 'new', 'millennial' referring to the learning modality required for the new millennium. This should be done whilst considering the ever increased growth of non-traditional learners in our universities and the problems associated with these students accessing an ever increasing quantity of internet based materials. It is proposed that this approach may initially be facilitated by giving students the opportunity to discover their preferred learning modality and by the integration of a range of multimodal learning and teaching strategies. This hypothesis will be supported with a summary of key points from research conducted on the first iteration of the Transmodal delivery of a first year foundation communications course, CMS1000: Communication and Scholarship, provided to off-campus students at USQ. This study investigated students' perceptions of this new multimodal delivery approach during Semesters 1, 2 and 3 of 2005. In researching CMS1000 a combination of qualitative and quantitative approaches were employed, an approach that has given the researchers, and more importantly the University, a clear indication of how students perceived this new multimodal approach to course delivery, that draws on students' comments and their perceptions of these environments. Taylor (2004) argues that traditional approaches to learning and teaching will not have the capacity to meet the escalating demands of higher education in the future. This is primarily due to the significant societal and technological developments that have resulted in major changes taking place in the field of higher education (Jochems, van Merrienboer, & Koper, 2004). These changes have not been restricted to individual institutions, but have occurred on a more global level, with institutions increasingly competing in the international marketplace for their students. This has required fundamentally new approaches to be considered in the delivery of course materials across the board (Kellner, 2004). In addition to this it is also known that, increasingly people learn in very different ways. For example, Oblinger and Oblinger (2005) tell us that 'Net Geners' (those who have grown up with computers, usually under 25) spend so much time online, it seems reasonable to expect that they would have a strong preference for Web-based courses, however, 'the reverse is actually true' (p.2.11). Conversely, older students (Matures and Baby Boomers) are much more likely to be satisfied with fully Web-based courses than are traditional-age students. Oblinger and Oblinger also state that, 'at the same time that colleges and universities are graduating their first Net Generation learners, most campuses are experiencing an influx of non-traditional students. Three-quarters of all undergraduates are 'non-traditional', according to the National Center for Educational Statistics' (p.2.8). Non-traditional learners being those who may: come to university later in life, only attend part-time, hold full- or part-time jobs, have dependants, may be single parents, or may not enter with an appropriate tertiary entrance qualifications. This is a very similar demographic to that of USQ. Either way, the need for universities to cater to a range of students with different experiences and backgrounds has never been greater, which is one reason why USQ has opted for a move develop a strategy for creating course resources based on a hybrid model, or what has become known as 'Transmodal' delivery. Transmodal delivery at USQ has its genesis in the principles of hybridised learning environments. The term 'hybrid' in the educational context embraces a range of approaches to learning and teaching that integrate a number of delivery media, mainly facilitated by the proliferation of information and communication technologies (Parsons & Ross, 2002). This approach was deemed necessary as USQ study materials are delivered in many different contexts; on campus in Toowoomba, Wide Bay and Springfield; for students studying at preparation level through to postgraduate; to international agents and partners; to independent and corporate groups of students. More importantly Transmodal delivery was designed to complement the University's new directions for learning and teaching articulated in its 'Leading Transnational University' vision (Lovegrove, 2004).This approach to course delivery has allowed considerable expansion of support mechanisms for both on- and off-campus students and has made them available en masse (Cookson, 2002). Associated with this is the increased reliance on the Internet for information retrieval, though currently restricted by the inconsistency of broadband technologies across the full range of diverse student bodies (Bruch, 2003). These issues, at present, have made a CD-based resource the most viable option for the provision of resource rich course materials for foreseeable future. Therefore, in the context of USQ, Transmodal delivery is seen as the provision of a resource-rich learning environment. 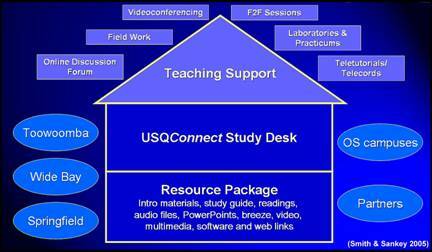 This environment is then further supported by different combinations of teaching support integrated with the universities learning management system USQConnect, as illustrated in Figure 1. For this to be the case, learning environments would need to be designed that were both consistent in their approach to navigation while at the same time be able to provide students with access to significant quantities of electronic resources. This approach does not deny the perceived need (primarily of academic staff) to also provide easy access to a more traditional print-based resource, if preferred. The CD-based approach is also used to provide students with their traditional print based resources; in the form of PDF files (see Figure 2). However the HTML based environment allows for significant multimedia enhancements (see Figure 3), support software, USQ information publications, and hyperlinks to additional resources to be provided on the CD. Printed resources are also made available for purchase from the USQ Bookshop if student prefer this option. However, as it will be seen, given the choice the majority of students would prefer to print their own from the PDF files provided on the CD. As the CD-based materials for courses are formatted in such a way as to permit them to be viewed as HTML pages, this allowed a range of navigation features to be incorporated. These features not only give course leaders additional options as to what they can provide (in the forms of links to additional resources both on the CD and on the internet), but it gives students a greater level of control over how they accesses these resources. With additional hyperlinked options students are presented with a choice (or level of control) as to whether or not they access an alternate representation of the material. This level of control has been seen by Ainsworth and Van Labeke (2002) to significantly improve the learning opportunities for students. Therefore, if a student prefers to listen to, or view a particular concept, as opposed to read it (or do both), they may. This aspect of these environments has been seen by the majority of students to be very helpful . It was also seen to make the process of learning (for many) more enjoyable, which in turn made the materials (for some) easier to learn (Sankey & St Hill, 2005). Previous research conducted by Anderson (2001) would support this claim. From her research Anderson believes that this approach causes students to actively think about the structure of the information being presented. As it is USQ policy that all students have access to the internet to fully participate in their courses, CD delivery may be further supported by activities housed on USQConnect. This provides each student with their own electronic 'Study Desk' with links to each course they are enrolled in. This environment offers the opportunity for the course leader to establish and use either asynchronous or synchronous discussion forums to enable students to interact and communicate with each other and the lecturer. Announcements and updates may also be made available where appropriate. This environment also provides links to all library services, the USQ Bookshop, to USQAssist where students may find answers to questions related to USQ systems and individual courses, and USQAdmin where students can enrol, change personal details, access results and other resource materials related to their course or enrolment. These systems offered on USQConnect play an extremely important role in student support and communication, with students interact both with each other and with the university. Integral to the design of the Transmodal course CMS1000 is the premise that students learn in different ways and that each student has a preferred learning modality (Sarasin, 1999). When this considered, and materials are designed to cater to multiple sensory channels, information processing can become more effective (Kearnsley, 2000). Fundamental then to the design of the Transmodal courses are the principles of multimodal design. 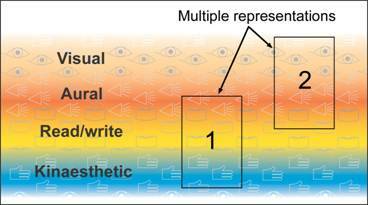 Multimodal information being, 'information presented in multiple modes such as visual and auditory' (Chen & Fu, 2003, p.350). This is based in research demonstrating that students prefer to learn in environments that reflect the cognitive style in which they are most comfortable (Hazari, 2004). Transmodal delivery makes this possible as information can be presented in ways that utilise multiple sensory channels to enhance both students' enjoyment of the learning. Chen and Fu (2003) state that, 'multimodal information presentation makes people feel that it is easy to learn and they can maintain attention, which will benefit the learning process and increase the learning performance' (p.359). In this context, the use of images is highly important, particularly for those entering higher education straight from school, the 'Net Geners.' This is also true in computer based environments where 'visual, displays are frequently useful for representing relationships amongst elements that are difficult to explain verbally' (Shah & Freedman, 2003, p.317). Even though visual images are proven to be an integral part of human cognition, they have tended to be marginalised and undervalued in contemporary higher education (McLoughlin & Krakowski, 2001). This is also true when utilising multimedia in learning and teaching environments to match students' different learning modalities (Ellis, 2004). For example, if material such as verbal texts (audio), diagrams, drawings, photographs, and videos are all regarded as texts to be read, they can be applied to the development of new inclusive curricula (Roth, 2002). It is therefore necessary to develop strategies for the multiple representation of a whole range of instructional concepts to cater to the diversity of learners we have today. The use of multiple representations, particularly in computer-based learning environments is recognised as a very powerful way to facilitate understanding (Moreno, 2002). For example, when the written word fails to fully communicate a concept, a visual representation can often remedy the communication problem (Ainsworth & Van Labeke, 2002). Figure 4 presents a simple illustration of this concept. Where Representation 1 may cater to a couple of learning modalities, it may not cater to others, so by including Representation 2 the other learning modalities may be accommodated. Examples of multiple representations include, using point-form text with video and audio (mini lectures introducing each topic in a course), animated diagrams with voiceovers, interactive graphs and forms, audio explanations of concepts, and still images. The type of multimodal learning approach established for Transmodal delivery provides a unique opportunity to bridge both generational and cultural factors, providing the face-to-face contact requested by Baby Boomers, the independence preferred by Gen-Xers, and the interaction and sense of community for the Net Geners. (Hartman, Moskal, & Dziuban, 2005). Jona (2000) asserted that this kind of learner choice represents the paradigm shift that needs to occur in higher education. An Important consideration in applying a strategy, such as the VARK inventory, is to also make available to students a series of study tips based on their modal preferences. CMS1000: Communication and Scholarship, is a first year core undergraduate course offered by the Faculty of Arts at USQ, with enrolments varying between 1000-1500 students per year. Due to high external enrolments in this course it seemed an ideal choice for CD-based Transmodal delivery. CMS1000 offers students the opportunity to gain understanding of the academic and psychological dimensions of communication. Academic writing, critical thinking, research, oral communication, interpersonal, group, nonverbal communication and barriers to communication form the basis constructs of the course. The course refers to different models of communication, but highlights the importance of the transactional process. This model reflects the dynamic nature of communication and describes how different channels of communication can be effective in different contexts. It was therefore appropriate that the course should itself use these different channels. Although there were some initial problems associated with the production, mainly because the lecturer had to come to terms with some new technology, the benefits of the CD medium became quickly apparent. The more the lecturer became familiar with the possibilities, the more she wanted to include features that would engage the external student (Sankey & Kiernan, 2005). Table 2 lists the range of multimedia based enhancements that were used in the CMS1000 Transmodal learning package. One element that was found to be particularly helpful for students was the mini lectures using the Macromedia Breeze software (PowerPoint presentations with a voiceover). As this change in delivery represented a substantial shift in the provision of the CMS1000 course resources (previously only a print-based course), it was seen as critical to understand how the students perceived these resources. It was also important to gain a clear understanding of how effective the multimedia elements had been in aiding student understanding of the core concepts within the course. A brief explanation of how this investigation was conducted and a summary of the results are shared below, the findings of which will be used to help guide both the future development of this course and of Transmodal delivery at USQ. The research model adopted for this study is a 'Concurrent Triangulation Strategy' (CTS) as defined by Creswell (2003). A visual representation of this model can be seen in Figure 5. This strategy allows the collection of both qualitative and quantitative data with a view to triangulating these data. The qualitative measure was administered to provide students with the opportunity to give a more in-depth account of their encounter with the learning environment (Barker et al., 2002). The survey consisted of 11 questions using a five point Likert type scale (strongly agree / agree / no opinion / disagree / strongly disagree), and three questions using a two point scale (yes/no) for collecting the quantitative data. Six open-ended response questions were used to collect the qualitative data. Of the 188 students responding to the survey 73% were female and 27% male, aged between 18 – 54 years, all studying externally. These figures are reasonably consistent with the demographic of the student body at USQ, where approximately two-thirds of the external students are female. Each of these students were supplied with a Transmodal CD containing all the study modules in an HTML format enhanced with multimedia elements and a PDF version of the materials. They also received a printed book of selected readings (also supplied ad PDF files on the CD) and were required to purchase a textbook. In addition, discussion forums for the course were hosted on the USQConnect portal, providing also an environment for announcements and answering of questions. "I thought the CD media an excellent choice for study material. The various audio and visual presentations provided variety and a much needed reprieve from the traditional method of reading text cover to cover and it made the learning experience fun." "Now that I have moved on to another subject, without a CD, I'm realising just how useful the CD was and how difficult I am finding it to learn solely from text. Thank you for the CD!!!" "The CD-based learning materials format (e.g. hyperlinking) were very helpful in helping me to locate/access related learning elements - faster/direct access provided. Yes, I would like to see the same in other courses." "I found them to be effective as opposed to another course I did that only had print. Could access what I wanted easier, instead of looking through print to find what I need." However, liking the materials and the ability to navigate is one thing; reading off the computer screen is quite another and a perceived concern of many lecturers. It was therefore important to gauge to what level students used the html based materials as their primary way of accessing the learning materials. Question 6 of the survey addressed this and asked students to indicate their response to the following statement: 'I used the navigation features on the CD as my primary way of accessing the course materials.' 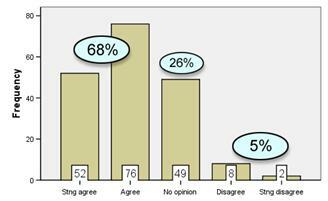 Figure 8 illustrates that 68% of the students either agreed or strongly agreed with this statement with 20% disagreeing and 12% chose to express no opinion. This high agreement rate was a surprise to the research team as it was anticipated that students would prefer the more traditional print-based approach; however, the opposite was observed. The qualitative data clearly shows that students were self selecting what they wanted to print, and only printing off what was necessary. This is demonstrated in the following comment: "I feel that the CD, with the printable option was excellent. It was great to access it on the CD and then print the necessary documents." Further, students saw other benefits to providing the materials in this way, as this comment indicates. "The CD reduces the amount of information supplied on paper which is great for the environment and information is easier to access and find on the CD." In making these observations it should not be overlooked that some 20% of the students did not use the CD as their primary way of accessing the materials. However, it is believed the following two comments give a good initial summary as to the sentiment being expressed by these students: "I feel the CDs are an excellent resource, although I also believe that the course booklet is a viable learning material as well." And: "I like to have paper in front of me to read through so I can do it anywhere while looking after children etc." The sentiments expressed by these and other students revolve around the convenience of (or lack of) access to their preferred way of accessing information. This will be investigated further in the following section. For portability; for example, they can read printed materials on the bus. To save them having to use the computer at home all the time; as many also used computers all day at work. The use of navigation and hyperlinking was regarded highly. "The CD is a link to the university in a special way. How? Well the CD has a lecturer speaking to use [audio]. Books are good and very useful; however they can sometimes be dry and rather static. Is not any learning, especially for one's career, supposed to be DYNAMIC?" Even though some students identified their preference to print out certain aspects of the materials it is seen that the advantages of what is supplied on the CD (by way of additional media) outweighed the disadvantages of having to print certain aspects of the materials. This point will be investigated in more detail in the following section. Having established there was a strong support for the CD-based materials this analysis will now investigate the responses to Question 14 that asked students to, 'Please choose your ideal combination of learning materials.' Figure 10 demonstrates how the students responded to this question. The majority of students (87%) chose to receive the CD and to either print what they required for themselves (52%), or purchase the printed version from the bookshop (33%). 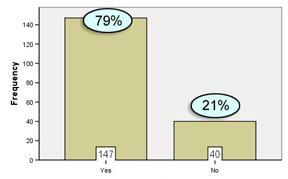 Ten percent of students identified wanting to receive 'only print materials', while 2% chose to receive the CD only. The research team believes this clearly supports the case being made above; that the use of additional media in the CD-based environment provides sufficient advantage to the students, enough to warrant them printing for themselves, or buying, a printed version of the materials from the bookshop. This being the case, the following section seeks to understand what it is students found so appealing about the use of this additional multimedia. The interactive elements used on the CD (such as Breeze presentations and the multimedia based tools) were very highly valued. In Question 7 of the survey students were asked to respond to the statement, 'The multimedia introductions (using PowerPoint and audio) used for each module; assessment and course overview really helped my understanding of the course content.' Seventy seven percent of students either agreed or strongly agreed that these elements had helped them to learn the content, with 7% indicating they hadn't found them helpful and 16% choosing to express no opinion (Figure 11). This sentiment may be summed up in the following two comments: "Sometimes reading is not enough to get it into your head and it needs to be spoken, the CD completes that need effectively." And, "Yes. Presenting material in a variety of formats and ways facilitates and stimulated my learning." In relation to the point made earlier about helping external students feel less isolated, one student offered this assessment of the multimedia features: "I found them extremely helpful - made me feel more a part of the class as well." This sentiment is expressed on at least 10 occasions in the qualitative data. One student commented: "The different ways of learning catered for my specific needs very well and I appreciated the time taken to include all the different learning methods." This is a very pleasing result and worthy of further investigation. "I found the PowerPoint's [Breeze presentations] particularly helpful. Being an external student, it is hard to study without actual contact with the lecturer, but by listening to the lecturer on the PowerPoint, it made it seem a bit more real. My learning style reflects the need to listen as well as read to gain the best insight into what I am studying." "These may seem like optional extras however I believe they enhance the learning process, by using more of the learning faculties that each person has at their disposal; a whole brain approach, including emotion and humour, which is particularly helpful for off-campus students." "PPT with audio was a huge advantage in learning the material. As an external student it was great to be able to have a 'lecture' at home to reinforce what I'd been reading in the text." This last comment makes mention of these presentations being used to reinforce what was being read, this was also specifically mentioned by a further eight students in the qualitative data. One particular area of concern was that 22 students experienced some form of technical problem with the CD that they could not easily fix themselves. However, eventually most of these problems were resolved satisfactorily with the help of the Distance and e-Learning Centre support services. Even though students were asked to explain the nature of the technical problem there is little indication in the data as to what these may have been. This is an area that will also need further investigation in future studies. The final area covered in this summary of the analysis is the students' use of discussion forums on the USQConnect portal; an essential part of the course design. 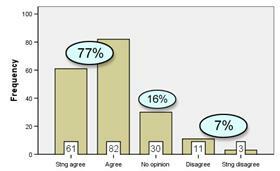 This was addressed in Question 3 of the survey (Figure 13) and asked students whether they had found this aspect of the course helpful. 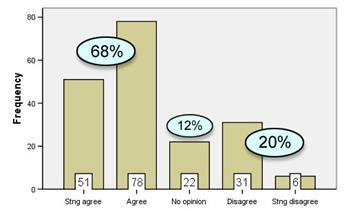 In response 68% agreed or strongly agreed that they had been helpful, 5% disagreed and 26% chose to express no opinion. Interestingly, there seemed to be a notable difference in the way males and females responded to this question, 72% of females were in agreement as against 59% of the male sample. However, due to the small numbers of male respondents (51) this study should not draw any strong conclusions from this finding; rather, this may be an area for further investigation. The strategy of using discussion forums, in this case, was clearly seen as being successful, but it may be suggested that its success, at a first year level, depends almost entirely on the active participation of the course leader in this environment; modelling good and appropriate behaviours. This is supported by the following comment: "Since the lecturer was always on hand for assistance (on discussion desk) and with fast helpful responses it worked very well. If the lecturer was not as approachable I don't think it would work as well." As noted above, there were only 5% of students who did not find these discussion forums helpful; however, there were a significant percentage of students who chose to express no opinion (26%). Even though there in no qualitative data to draw on to give an indication as to why this may be it may be suggested, based on anecdotal evidence from the course leader, that many of these students simply did not use this aspect of the course. There was an unmistakably strong endorsement of Transmodal materials, though they clearly did not suit everyone. Having said that, those who did not use the CD were happy to either print for themselves what was required or purchase a printed version from the bookshop. The use of technology, particularly the Breeze and multimedia presentations, was seen to help the students' understanding of the course concepts and to help break down some of the barriers that may make external students feel more isolated. Of some concern was that a few students did not have easy access to, or sufficient understanding of, the technology. This may require USQ to either make the access to print materials easier, or ensure clear communication of the options. Even though the results suggest the Transmodal delivery of this course was successful overall, and that it did serve to complement or replace the print materials, further consideration must still be given to the different learning styles of students. For example, print materials must be made available for students who have a read/write learning preference. The potential to make learning more interesting (and sometimes fun) for external students is clearly demonstrated in this study. The first iteration of the Transmodal delivered in 2005 of CMS1000 was received well by most students, and based on the feedback received the lecturer saw great potential to develop these materials even further. The lecturer for this course was extremely pleased with the responses made by the students and has seen a distinct advantage in improving course materials in this way (Sankey & Kiernan, 2005). As a result she has rewritten aspects of the materials to take full advantage of the available technology. It was also seen that it is extremely important for the lecturer to make the expectations for using the CD-based environment as clear as possible to students. Explicit instruction will need to be given to students on how to access the printed version from the bookshop, or the most effective strategy for printing for themselves. One possible strategy is to alert students to the options up front by placing a statement on the course specifications; as students are expected to access these prior to enrolling in a course. A series of video interviews with experts talking through elements of the content will be created. For example, an actor/director discussed communication barriers between actors and stage management staff; and a psychologist talked about the benefits and problems of self-disclosure. It is hoped that by sharing different viewpoints students' will realize the there are many different ways of interpreting communication. More interactive exercises will be developed. A series of formative quizzes and activities will be added to the CD to help students revise modules and self-test their understanding of key concepts. Sample assignments will be animated and narrated. This will make it possible to highlight key points and tie this in with relevant voiceovers explaining their function. More images, icons and colour will be integrated into the environment. This will make the materials more engaging (particularly for visual learners) and visually attractive. It will also serve to break up what can become lengthy pieces of text. The student response to the next version of the Transmodal CD will be vital in determining if the above approach has been warranted and a potential way ahead. If they respond more favourably than students in the previous three semesters when the CD had less features, then there could be an even more creative blend of technology and traditional academic processes proposed for future iterations. This paper has attempted to demonstrate that there are distinct advantages (for students) in providing course resources designed to suit a range of different learning modalities and backgrounds. The findings from this research project investigating the Transmodal delivery of CMS1000 indicates that students had positive attitudes toward, and value, the multimodal course materials along with the additional multimedia components. It was seen in the feedback that higher levels of student engagement were possible when utilising imbedded multimedia elements as these were seen to cater to the students' preferred way of learning. In particular, students agreed that they enjoyed using the course CD, found it easy to use and navigate, and also agreed that the course materials had assisted their performance in the course. This was primarily achieved by providing a more complete representation of the information being presented, thereby increasing the opportunity of students to engage with their learning materials. Importantly, this was achieved whilst maintaining a balanced environment for more traditional learners, while at the same time integrating a range of multimedia based enhancements for those who learn in non-traditional ways. Clearly further research into this form of delivery is required and this paper has identified at least two; the areas of technical problems with the CD; and the use of the Breeze software to present lecture style presentations. It is hoped that the findings of this study may encourage more educators to consider the adoption of educational technology for the purpose of designing and delivering distance education courses, starting at a first year level. However, in doing so there are important issues relating to how the implementation of these new technologies can be best integrated before the full benefits to the learning community can be realised. Ultimately, what this paper is suggesting is that, designing for multimodal learners may reduce the impact of providing course materials to a very diverse and an increasingly non-traditional student body. This new approach for this new millennium (neomillenial) has seen USQ develop what it now calls Transmodal delivery. Ainsworth, S., & Van Labeke, N. (2002). Using a multi-representational design framework to develop and evaluate a dynamic simulation environment. Paper presented at the International Workshop on Dynamic Visualizations and Learning, Tubingen, Germany. Anderson, M. D. (2001). Individual characteristics and web-based courses. In C. R. Wolfe (Ed. ), Learning and teaching on the world wide web (pp. 45-72). San Diego: Academic Press. Barker, C., Pistrang, N. and Elliott, R. (2002) Research methods in clinical psychology: An introduction for students and practitioners, John Wiley & Sons Ltd, West Sussex. Bruch, A. (2003, October). A treatise on the new skills needed for the creative student to be able to operate as successful practitioners in the new economy. Paper presented at the Create.ed 2003: eLearning for the Creative Industries, RMIT, Melbourne. Chen, G., & Fu, X. (2003). Effects of multimodal information on learning performance and judgement of learning. Journal of Educational Computing Research, 29(3), 349-362. Coffield, F., Moseley, D., Hall, E., & Ecclestone, K. (2004). Should we be using learning styles? What research has to say to practice. London: Learning and Skills Research Centre. Cookson, P. (2002). The hybridization of higher education: Cross-national perspectives. International Review of Research in Open and Distance Learning, 2(2), 1 - 4. Creswell, J. W. (2003) Research design: Qualitative, quantitative, and mixed methods approaches, SAGE Publications, London. Ellis, T. (2004). Animating to build higher cognitive understanding: A model for studying multimedia effectiveness in education. Journal of Engineering Education, 93(1), 59-64. Hartman, J., Moskal, P., & Dziuban, C. (2005). Preparing the academy of today for the learner of tomorrow. In D. Oblinger & J. Oblinger (Eds. ), Educating the net generation (pp. 6.1 - 6.15). Boulder, Colorado: EDUCAUSE. Hazari, S. (2004). Applying instructional design theories to improve efficacy of technology - Assisted presentations. Journal of Instruction Delivery Systems, 18(2), 24-33. Jochems, W., van Merrienboer, J., & Koper, R. (Eds.). (2004). Integrated e-learning: Implications for pedagogy, technology and organization. London: Routledge Falmer. Jona, K. (2000, December). Rethinking the design of online courses. Paper presented at the ASCILITE 2000: Learning to choose, choosing to learn, Coffs Harbour, Australia. McLoughlin, C., & Krakowski, K. (2001, September). Technological tools for visual thinking: What does the research tell us? Paper presented at the Apple University Consortium Academic and Developers Conference, James Cook University, Townsville, Queensland, Australia. Moreno, R. (2002). Who learns best with multiple representations? Cognitive theory implications for individual differences in multimedia learning. Paper presented at the EDMEDIA 2002 Conference, Denver, Colorado, USA. Oblinger, D., & Oblinger, J. (2005). Is it age or IT: First steps toward understanding the net generation. In D. Oblinger & J. Oblinger (Eds. ), Educating the net generation (pp. 2.1-2.20). Boulder, Colorado: EDUCAUSE. Punch, K. F. (1998) Introduction to social research: Quantitative and qualitative approaches, Sage Publications, London. Roth, W.-M. (2002). Reading graphs: Contributions to an integrative concept of literacy. Journal of Curriculum Studies, 34(1), 1-24. Sankey, M., & Birch, D. (2005, 28-29 October). Researching transmodal delivery at USQ: Different horses for different courses. Paper presented at the New Researchers for New Times conference, Queensland University of Technology, Brisbane. Sankey, M., & Kiernan, E. (2005, 10 August). 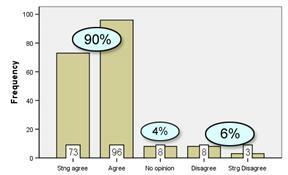 Reviewing the first CMS1000 Transmodal CD: A report on what students thought. Paper presented at the Faculty of Arts Learning and Teaching Enhancement Committee Research Forum, University of Southern Queensland, Toowoomba. Sankey, M., & St Hill, R. (2005, 11-12 July). Multimodal design for hybrid learning materials in a second level economics course. Paper presented at the Eleventh Australasian Teaching Economics Conference: Innovation for Student Engagement in Economics, University of Sydney, Australia. Smith, A. & Sankey, M. (2005) Transmodal delivery: Issues and approaches. USQ Academic Staff Development Workshop. University of Southern Queensland, Toowoomba. Also available online at http://www.usq.edu.au/users/sankey/Resources/Transmodal.pdf. Taylor, J. C. (2004, February). Will universities become extinct in the networked world? Paper presented at the ICDE World Conference on Open & Distance Learning, Hong Kong. Vergnani, L. (2005, 8 June). Learning to enjoy e-learning. The Australian, p. 31.